Thank you for taking the time for this interview. Thank you so much for inviting me. I really appreciate it. Your fans might not know that but you keep bees. How are they and how in the world do you fit the work with them in your busy schedule? I’m sad to say I had to give the bees away as the place where I kept them was next to someone who was allergic to bees, and he was so worried about them I gave them away to another bee keeper. I only had two hives, so it wasn’t a lot of work, except at harvesting time, and then the result made it all worth while. <g> I loved having my own honey to eat and give to friends. It was delicious honey, too, much tastier than any you’ll find in the shops. On your homepage you write about Georgette Heyer. Was she the first historical romance author you’ve read? Do you remember the very first romance novel you’ve read? She probably was. I was eleven when I first read her books and I never looked back. I also read Mary Stewart at around the same age — my sister worked in a library and used to bring me home the cancelled books. But I didn’t think of them as romances and for a long time I didn’t even think of reading a romance because i didn’t think I’d like them. I really only started reading romances on the recommendation of friends, when I first started writing, and I took to them like a duck to water. So I came to romance reading quite late in life. What was the appeal of that genre that you decided to write your novels in it? I like the adventure, I like the setting of the regency which means I can set scenes in ballrooms, or battlefields or balloons. I also like writing a story that’s historically pretty accurate but where the history is so woven into the story people don’t notice. I love it when someone writes to me and says „I don’t normally like historicals but I read your book and I loved it.“ For me, that’s the highest accolade. But also, it was partly that when I first started writing, I was trying to write serious contemporary romance (because i didn’t know any other kind) and then I discovered publishers were publishing regency-era romance, and I thought, „Oh, I grew up on Georgette Heyer, I can write that.“ And so I tried and I sold that first book, and then I discovered it was a very popular genre so I stayed. I actually did write one contemporary comedy and I had a lot of fun with that. But the historicals keep me so busy I have no time to write more. I simply adore the humor in your novels. How do you come up with those witty dialogues? What a lovely thing to say! Thank you. I wish I could claim it’s the result of some clever process, but really, I’m deeply flippant at heart — I was always getting into trouble at school for laughing or cracking jokes when I was supposed to be serious — and if the chemistry is right between the characters, it just comes. I hear snippets of conversations between characters all the time and wherever I am, I write them down so I don’t forget. Your four books of the „Perfect“-series feature very different heroes: From light and funny to dark and dangerous – there is one type for every reader. Do you have difficulties with one type or are they all easy to write? I actually never think of them as „types“ so that makes it easier. Each character comes to me in the writing — sometimes they stroll onto the page fully formed, like Gideon in the Perfect Rake, other times I need to dig more into their back story to find out what makes each one tick. In Germany we now have the translation of „The Perfect Kiss“ (Ein verbotener Kuss), the last book of the „Perfect“-series. What was the most memorable moment you have when remembering the writing of this book? For „The Stolen Princess“ you did a collage. Is that a technique you would recommend other aspiring writers? Do you use this technique for new novels? I’ve made a collage for about half my novels. I first learned of this technique from my friend Barbara Hannay, but at the time I didn’t think it would work for me. The first collage I did was a kind of procrastination, really. It was for the Perfect Kiss, and I LOVED it. So since then I’ve made story collages. I don’t always put them up on my website because sometimes they give too much of the story away, but I’m working on one for my next book right now. I don’t think it matters if you’re a new writer or a seasoned one. 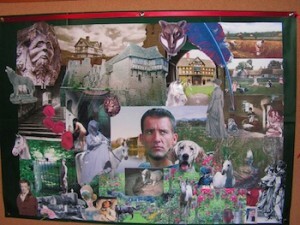 Collage works for some people and not others. I’d suggest people try it if they’re interested, but if not, don’t worry. On your website there is a map with the locations of the web-visitors. They come from all over the world. Do you get fan-mail from foreign countries? How do you keep in touch with your fans? I do get mail from people from all over the world. It’s wonderful. Some of them read the books in translation, some in English. I am so impressed with people who can read my books as their second (or third or more) language. I get emails from readers, and I’m also on twitter and FaceBook. 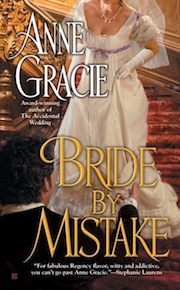 For the new novel, „Bride by Mistake“, you plan a blog tour. What’s that about and what can fans expect from your online-visits on the different blogs? It’s a virtual tour, where I blog at different sites to introduce my book to a different group of people, and hopefully interest them in buying it. The tour is coming to an end now, but you can still find the blogs. Each blog is a bit different — I wouldn’t want to bore people with the same thing — and most contain a short excerpt from the book, again, not all the same. And at each blog I give a book away. In your „Devil Riders“books the heroes are good friends and help the others. How important is such a connection for you in your sequels and books? If you mean how important I think friendships are in life, they’re hugely important. In books, I like it when the characters have friends as the various friends reflect different things about the character and I really enjoy seeing a hero interacting with his friends as it’s different to the way he is with the heroine. Plus I think you can make some judgements about people by their friends. But though the books are linked by friendship or family, I try to make each book a stand-alone story. As a reader, I don’t like it when I pick up a book and there are too many references to events and people from other books, or a big info-dump about What Went Before. So the other characters in a series only appear in my books if there’s a reason for them to be there. „Bride by Mistake“ has an independent heroine and a soldier-hero who expects her obedience. What can readers expect of the novel and will it be the last in the series? Do you already have a new project in mind? For a start, Bella doesn’t turn out to be the docile, obedient bride Luke’s expecting. <g> „Bride by Mistake“ is a convenient/inconvenient marriage story, but it’s also a road trip (they’re travelling across Spain), an adventure and a story about facing the past, and about love and redemption. It is the last in the series, though I’d still like to write Marcus’s story — he’s a character who appeared in the other stories in an unexpected way. He intrigued me and a lot of readers have written to ask for his story, but he’s not included in the contract and my publisher is very keen to me to start on the new series I proposed to them, so I’m currently writing that. It’s about four young women, taking a chance in London. Thank you for your time. Since the „Perfect“-series has already been translated in Germany, I sincerely hope we’ll get the „Devil Riders“, too. I really hope so, too, Julia. 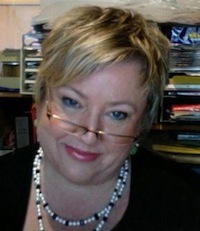 Thank you so much for this interview, and thank you for reading my books.